Good Karma Dance. Live Well, Party Hard! 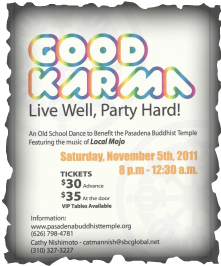 An Old School Dance to benefit the Pasadena Buddhist Temple. Featuring the music of Local Mojo. Bar drinks and snacks will be offered for sale. VIP Tables: $500. Reserved table with seating for 10. Drink tickets, complementary water and snacks.